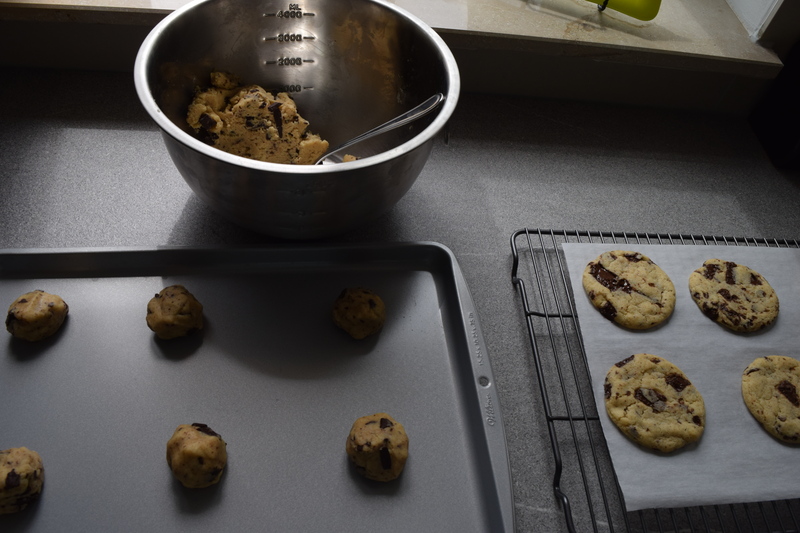 I’ve been a long-time fan of baked goods, so with no more weekly sweets from my baking savvy Minnesota friends (*wink wink* you know who you are), I’ve really been craving some homemade treats since my move. 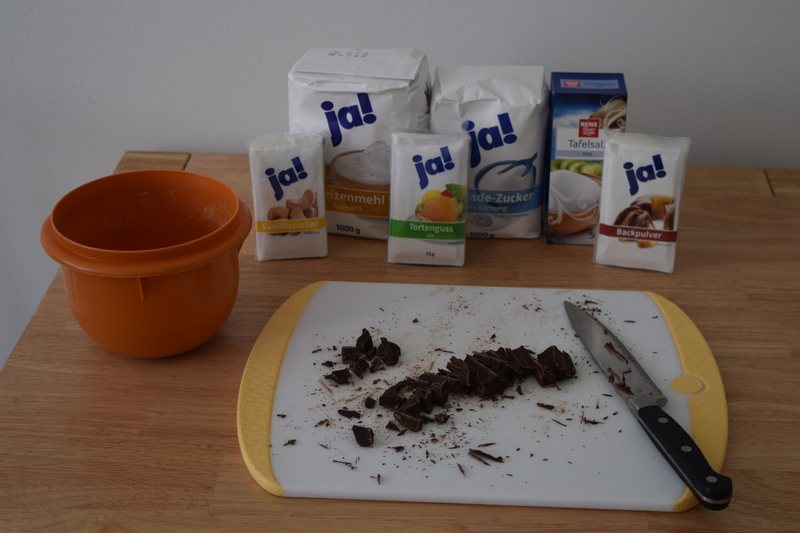 I decided to tie on my apron and see if I could make an American dessert recipe work with German ingredients! Items in bold were impossible to find in any Leipzig store. Luckily I was feeling adventurous, or maybe it was the problem-solving engineer in me, or my desperation for something sweet, but I wasn’t ready to give up. I felt confident that I could find suitable substitutions, even if I could barely read the labels. Cornstarch ⇒ Tortenguss, my crowning achievement. I’m not actually sure what this stuff is, all I know is you can barely find corn in the grocery store, let alone cornstarch. But I picked this up from the baking aisle because the first ingredient listed was Kartoffelstärke (potato starch), so I figured potato, corn, it should work either way, right? The final result! Mmmmmm! Soft and delicious, as advertised! Right! It did work! 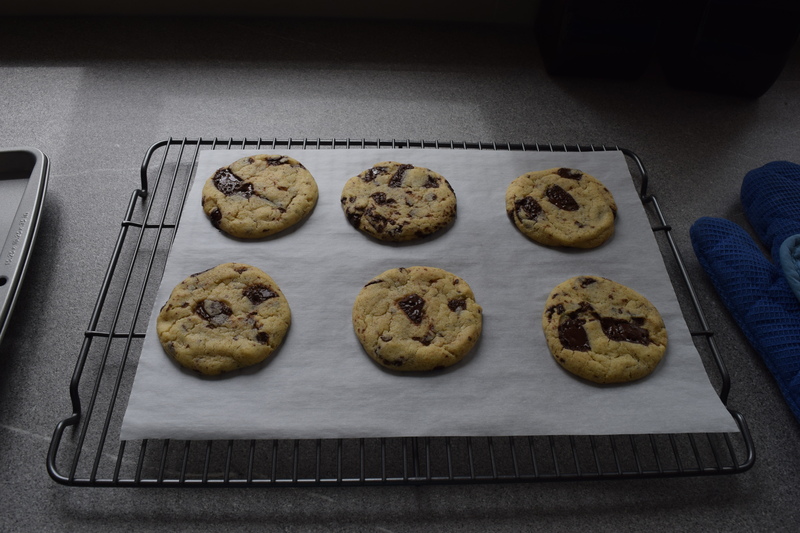 These super soft cookies turned out so well they were all gone within two days (granted we did share many with Craig’s hockey team). The moral of the story is don’t let a few missing ingredients stop you from pursuing your sugary dreams*! You can do it! Improvise and the results might just astonish you! *unless you are diabetic, then better not. What about you? Have you ever lived somewhere where you couldn’t find common cooking ingredients? Have any suggestions for cooking substitutions? Share in the comments! Awesome way to improvise! You really figured out a way to make it happen! You’ve got this! Exactly. I’m not gonna indirectly claim ownership over something and risk aggravating another blogger, or worse a lawsuit! Okay, here some explanations: Unlike in the US where you get more or less everything in the common Supermarket, in Germany it pretty much depends on the Supermarket what you get. The cheaper ones like Aldi only have everyday products, so you won’t find much for baking there. You have to go to Supermarkets like Edeka or even better Rewe, which are a little bit more expensive but have a larger selection on “special” products. Vanilla extract is indeed difficult to get, but I recommend to keep your eye out during Christmas time. Than you usually get more or less everything related to baking and can store it for the year. Corn starch is indeed not available, though (I had to look up what that even is). Tortenguss is basically sugar with gelatin. It is usually used to cover torte with a white layer. Haha yup, I got all that stuff at Rewe. I kind of expected I wouldn’t be able to find vanilla, but I was honestly surprised about the other items. They seem so common in the US, I guess I assumed that our baking practices were international. Not a problem, though. Now I just have to find German recipes to try! (And I’ll definitely be on the look out for more supplies at Christmas time!) Thanks for commenting! Na, nothing is universal. For example green jello over here doesn’t taste like lime, but like woodruff (which I guess you have never tasted before because it is a very German thing). The most popular potato chips are paprika flavoured. We don’t bake pies, but we have a bunch of very tasty Christmas recipes. We like proper bread and our sausages. A good place to buy brown sugar is, btw, Edeka. They have it in every variant possible (which I know because I am tea drinker). Love reading your blog. I have also found mixing a half teaspoon molasses with regular white sugar is a great brown sugar substitute. And I’ve also used Natron for baking soda. Keep up the baking! Try the basement grocery in Karstadt and the Asian markets for vanilla extract, corn starch, and brown sugar. It takes going to more places, but you can find what you seek in most cases. We bake often, so it was important for us to find good quality ingredients. I make my own vanilla extract and I found the brown sugar in the Asian market. Right now what I can’t seem to find is corn syrup (for pecan pie). Any ideas?? Why didn’t you google translate baking soda? In Germany it’s called natron and they sell it beside the backpulver (baking powder) in every single supermarket lol it’s the easiest thing to get your hands on! Always in those stupid little packets, never a nice big box though. Cornstarch, is that corn flour? I get mine from the Turkish grocery stores or the Asian ones. But it’s true- I can’t find brown sugar, the soft kind or vanilla extract anywhere and no the vanilla sugar doesn’t compare.